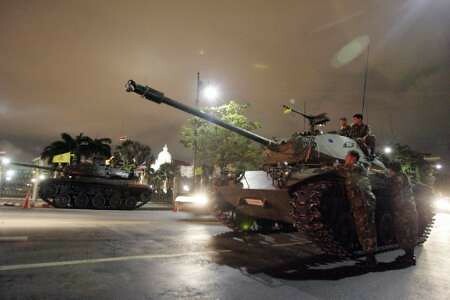 Last night when I heard that Bangkok had tanks running around on the streets, I thought it was in response to the bombing incident in Thailand afew days ago. I was informed via CNA and friends that the army has actually planned a military coup and ousted the Thaksin govt by taking over the government house. It was kinda funny though since Thaksin announce the state of emergency from NY while the army imposed martial law and sealed off the northern borders. Then again though, I'm not really in any position to comment about this whole issue. Anyway, CowboyCaleb's in Thailand now (not Bangkok though) and provided quite a fair bit of updates for all of us, while Nad is quite sian 1/2 about having such a thing happening just days before her trip to BKK to shop. However, it's always nice to know that this entire military coup episode is temporary as they have already declared that they'll return the power as soon as possible, and that this entire thing will be bloodless and peaceful. As for more info, pls kindly refer to CBC for more updates.